A dwarf hamster makes a great pet for older kids and even adults. 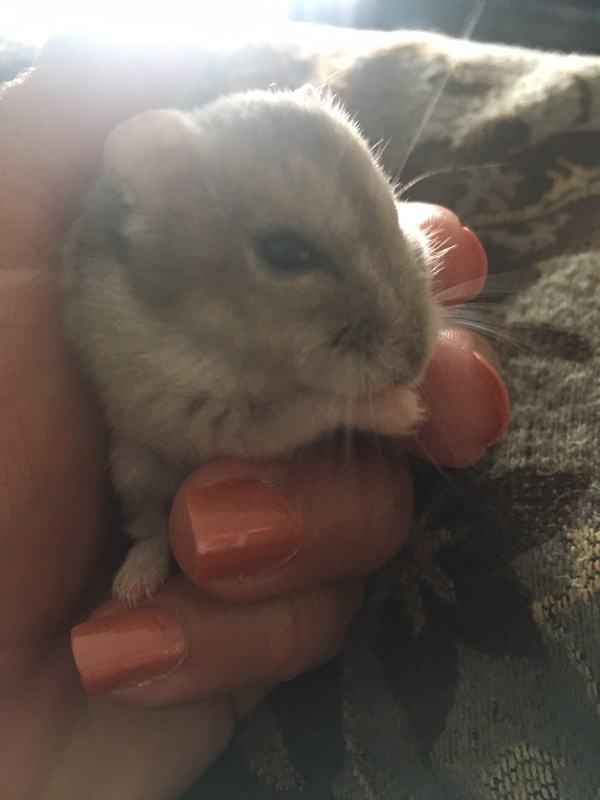 This page is a complete guide to dwarf hamsters and will tell you all about these furry little pets as well as how to choose one, how to prepare for your new dwarf hamster and how to take care of it. Dwarf hamsters are super cute and about half the size of a regular Syrian hamster. They have cheek pouches where they stuff their food and you’ll often see them stuffing their cheeks full, giving the impression that their head is much larger than their body. There are three types of dwarf hamsters – the Roborovski dwarf hamster and the two Russian dwarf hamsters — Winter White dwarf hamster and Campbell’s dwarf hamster. It’s also possible for hybrids to be created from Winter Whites and Campbell’s. A fourth species, the Chinese dwarf hamster, is more rat-like and not related to the other three. The Roborovski dwarf hamster or robo dwarf hamster is the smallest hamster species kept as pets. It measures less than 3 inches even in adulthood. In the wild, robo dwarf hamsters can be found in the deserts of Russia, Kazakhstan, and northern China. They eat grains, vegetables, fruit, as well as insects and meat in small amounts. Robo dwarf hamsters are fast and very active. When you visit a pet shop with robos, you’ll often find them running on the wheel. In fact, they have been known to run as much as four human marathons on average every night. That’s more than a hundred miles! A robo dwarf hamster is usually grayish-brown with a white underbelly. There is also a type that has a completely white face and is sometimes referred to as a Husky robo or a white-face robo. Unlike other dwarf hamsters, robos don’t have dorsal stripes. The average lifespan of a robo dwarf hamster kept as a pet is 3 years, although they have been known to live up to 4. Robo dwarf hamsters should be bred no earlier than four months for females and three months for males. The gestation period is 22 to 30 days and usually four to six pups are produced. Russian dwarf hamsters can refer to the Winter White or Campbell’s dwarf hamster. The two appear very similar and are often confused for each other. In fact, scientists have classified them as the same species for many years. The term “fancy Russian dwarf hamster” simply refers to Russian dwarf hamsters that are attractively colored. Winter white dwarf hamsters, also known as the Djungarian hamster, winter white hamster or Siberian hamster, are 3 to 4 inches long in adulthood. The name “winter white”, comes from the ability of these hamsters to change color from dark gray to white in the wild during winter. Pet winter whites do not usually turn white in the house due to artificial lighting/heat in the house. Other than dark gray with dorsal stripes and a white belly, winter whites also come in pearl, sapphire, sapphire pearl, and marbled. In the wild, the winter white dwarf hamster can be found in Siberia, Russia, and Central Asia. They can live for as little as one year in the wild, but the average lifespan of a pet winter white is usually one to three years. Winter whites can be bred at 4 to 6 months old and have a gestation period of 18 to 25 days. Usually 4 to 8 pups are born although there have been instances where there are up to 14 pups in a litter. Campbell’s dwarf hamsters are the other Russian dwarf hamster and are the most common dwarf hamsters found in pet stores. They are very similar to winter whites in appearance. Campell’s dwarf hamsters can be found in the wild in Russia, China, and other parts of Central Asia. As pets, they can live for 2 to 2.5 years but have a shorter lifespan in the wild. Campbell’s should be bred no earlier than three months and have a gestation period of 18 to 20 days. A Campbell dwarf hamster can have up to 10 pups in a litter. Hybrid dwarf hamsters are bred from winter whites and Campbell’s dwarf hamsters. They are usually bred for their attractive colors such as orange, pudding, or brown but are prone to numerous health problems. Due to this and other ethical issues, crossbreeding the two Russian dwarf hamsters to produce hybrids is controversial. The correct term for this hamster would be the Chinese hamster although they are commonly mistaken for dwarf hamsters due to their size and possibly their black dorsal stripe. Chinese hamsters are not related to the other dwarf hamsters mentioned above. Unlike dwarf hamsters which have really small and flatter tails, Chinese “dwarf hamsters” also have longer and thinner tails. If you haven’t decided which species to get, I would recommend either a Winter White or a Campbell’s dwarf hamster as these are easier to tame and handle than roborovski dwarf hamsters. Also, a pure breed is preferable as hybrids are more prone to illnesses and disease. Make sure your hamster is healthy. The dwarf hamster should have clear eyes and nose, and no bald patches or scabs on its skin. Don’t buy from the same cage (or even store) if ANY hamster has wet tail. This is an infectious disease that is fatal to hamsters. If any of the hamsters in the cage has wet tail, the others are already at risk of getting it even if they look healthy for now. Determine the gender of your hamster. Many people pick a hamster at random and have trouble identifying its gender later when they’re trying to name it. Ask an employee at the store to determine the gender of your new pet so you don’t have to worry about it later. Note: This is not 100% foolproof, sometimes the hamster is too young for you to determine its gender immediately, or the employee might just get it wrong. Before you bring your dwarf hamster home, you’ll need to ensure that you have a suitable location to place its new home. The location should be away from direct sunlight or draft as well as quiet and safe from potential predators (including other pets such as cats and dogs). Do note that your dwarf hamster is nocturnal and will be squeaking, scratching, or using the wheel a lot at night. If you’re a light sleeper, don’t put the cage in your bedroom! You probably already know this but you’ll need to house your pet in a cage or a tank. Dwarf hamster cages come in many sizes but you should pick the largest one you can afford. If you are getting a cage, ensure the bars lining the cage aren’t too big for your dwarf hamster to squeeze through. If you don’t want the hassle of setting up your own tank, the Super Pet CritterTrail One Level Habitat Pink Edition is a good cage that comes with a food dish, water bottle and an exercise wheel. However, it’s actually pretty small although it is expandable. Hamster Hideout, a popular hamster forum, recommends at least 360 square inches of space for a cage so if you go with their recommendation, you’ll definitely have to get the expansions. Alternatively, you can get a glass tank or a plastic bin and fill it up with your own hamster accessories. Your dwarf hamster will need fresh and clean water so a water bottle is absolutely necessary. Bottles can be standing or hung from the cage. Don’t get a water dish because your hamster will most likely kick bedding into it. If your cage doesn’t already come with a bottle, you can get the Lixit Aquarium Cage Water Bottle for either cages or tanks. This comes with an adjustable wire hanger that you can adjust to a suitable height for your dwarf hamster.The Lixit Aquarium Cage Water Bottle is chew-proof and climb-proof so you don’t have to worry about your pet gnawing it up or escaping by climbing on the bottle. In the wild, dwarf hamsters can travel for miles every day. You’ll need a running wheel to keep your hamster healthy and happy. Make sure you get one without rungs as gaps in the wheel can result in broken limbs or injuries if your hamster falls through them. The Super Pet Hamster Silent Spinner is a good choice if your tank or cage doesn’t come with a running wheel. This 6.5″ wheel is large enough for one or two dwarf hamsters and is designed to spin silently when your dwarf hamster runs on it. So if your hamster cage is in your bedroom or somewhere you don’t want a lot of noise, this wheel will ensure you have your peace when your pet is most active at night. The Super Pet Hamster Silent Spinner can be attached directly to a cage or placed on its stand in a tank. Your new pet will need a hiding place. Many people get ceramic hamster hideouts for this purpose. You can also make them out of toilet rolls. The Small Animal Kingdom 2-Storey Hamster House makes a good hiding spot for your dwarf hamster if you prefer something that’s more aesthetically-pleasing than a toilet roll. This two-storey hamster house has plenty of openings for your pet to explore, hide in, and stash his goodies. It is important to choose a bedding that is non-toxic and comfortable for your new pet hamster. Cedar and pine shavings are not recommended as they may cause your pet to develop respiratory problems such as asthma. If you are interested behind the science, this page provides good information. 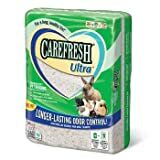 The Carefresh Ultra Pet Bedding is what I use for my pet robo dwarf hamster and I highly recommend it. The bedding is non-toxic, soft, highly absorbent and prevents odor for a longer time than normal bedding made from wood shavings. It is a little more expensive than other types of bedding but for your pet’s health, this is a great investment. Also, because of its odor control and absorbent properties, you don’t have to change the bedding as much. For other choices, check out our page on the best hamster bedding. 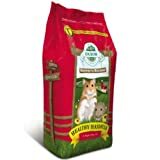 Buy a hamster food mix that contain a variety of different food so your dwarf hamster can get all the nutrients it needs. If you wish, you can supplement your hamster’s diet with some fresh food or give them a treat of other seeds, nuts, and even the occasional mealworm (!). For a health dwarf hamster, Oxbow Healthy Handfuls Hamster and Gerbils Complete Stabilized Food is one of the best commercial hamster food you can get. This food is optimally-balanced with the essential nutrients your pet needs. It does not contain seeds or high-sugar fruits or any artificial preservatives. Many hamster owners have reported that their pet loves this feed (i.e. does not reject it). Non-toxic wooden toys for your hamster to file down its teeth. Alternatively, you could use card board tubes or popsicle sticks. If you prefer a better-looking chew toy, the Super Pet Perfect Chews for Hamsters may be what you’re looking for. 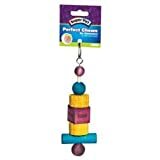 Colorful and attractive, this chew toy can be hung from any cage or tank. It’s also pretty entertaining to watch your hamster swing it around. If your dwarf hamster is biting its cage bars or chewing up other cage accessories, this might be a good product to stop it from doing that. These are special food to be given sparingly or used as a reward for your hammy. Check out our list of healthy hamster treats if you want to get some for your new pet. A hamster ball supposedly lets your dwarf hamster roam outside its cage in the safety of a bubble. Unfortunately at this point of time, I cannot find a hamster ball that is actually safe enough. It is important to monitor your hamster even if it’s in the ball. In many cases, this item is not necessary. If you need to put your pet outside, try putting it in a box or an enclosed area. If it’s for exercise, a running wheel placed in your pet’s cage is more than sufficient for this task. Hamsters keep themselves clean and should never be bathed in water. Some of them might enjoy sand baths though. The Super Pet Ceramic Small Gerbil Bath is not just for gerbils. Dwarf hamsters will fit perfectly into it too. You can also find out how to build your own DIY hamster bath house. Be sure to put only a few spoonfuls of sand in the bath each time, or your hamster will end up kicking the sand everywhere. If you need to get the bathing sand too, the Super Pet Critter Bath Sand is a pretty good choice. You can get a food dish for your hamster or just hide food around the cage and let it look for it. If your food dish is placed on the cage floor with bedding, your hamster is most likely going to kick bedding into it. I suggest placing the dish on a stand or a different level if you have a multistorey cage. The Living World Ergonomic Dish is a low-cost and sturdy food dish. This is made from heavy ceramic dish so it won’t topple over easily when your hamster tries to get into it. I’ve used plastic ones and they almost always get tipped over. Not a problem with this. The Living World Ergonomic Dish comes in two sizes but for a dwarf hamster, the small one should suffice. Now that you know about the types of dwarf hamsters, how to pick one out, and what supplies you need, it’s time for you to go out and get a pet that’s most suitable for you and will provide many months of fun and love. To help you take care of your new pet, we also have many other pages linked in our menu and sidebar that are useful for the new dwarf hamster owner. If there is anything you need to ask about dwarf hamsters, please feel free to contact us or leave a comment. Would you recommend using those sand baths as a regular hamster house as well? Hm..there’s no guarantee how long a hamster can live, whether it will make noise or bite, or if it’ll even like being in a hamster ball. But if I had to pick one, I would get a winter white. Hi, my husband and I just bought a cambell dwarf hamster two days ago, we named her Venus :). We had a few questions but didnt think of them until we got home. Maybe you can help? Venu doesnt seem to like her food at least thats what we think is going on, she digs into the bowl of food for a while and then starts to throw it around and she also hasnt drank any water what so ever, should we be concerned? And she pays her wood chew toys no attention, are her teeth going to overgrow? Thank you very much, you right she was just getting used to everything, she’s drinking her water now and eating i just had to figure out what she actually lokes from her mix and seperate it allI feel bad though because my husband and I are building her a bigger cage so she has more space but I don’t want her to have to start over again. hi the same happened to me and i got REALLY worried!! the water is fine your hamster will start drinking in a few days but my hamster still does not like chews!!! try giving ur hamster some raw pasta and more pellets in her food bowl as pellets are hard to chew and will wear down her teeth a bit!! Hi! I recently adopted a hamster and she came with Wild Harvest Daily Blend hamster and gerbil food. I don’t want her to eat anything unhealthy so is this a good diet for her? She is a dwarf hamster by the way and I put a tablespoon of food just for now so she doesn’t starve. 🙂 Thank you in advance! She also has a 4.5 Silent Spinner wheel which seems a bit small, but she was the runt of the litter and when she runs her back doesn’t bend. I would like someone else’s opinion on this :/ Thanks! Hi any idea’s on spots? I have 2 rusian dwarf hamsters and one of them have developed a spot behind one ear about 2 weeks ago and noticed one now on his eye too. They are clean and healthy we have had them over 2 years – any idea what i can use for them? It sounds like a dwarf hamster but I can’t really tell what kind from your description. Do you have a photo? A VERY IMPORTANT thing to note, is that chew toys and wood chews are a MUST HAVE for ALL hamsters. Due to the fact that their teeth are constantly growing, they need something to help wear them down. Not all hamsters will enjoy the chews you give them, so be sure to give them a variety of chews. Toys are also important because they occupy your hamster when you are not home and helps keep them from doing any bad behavior. Yes..the father will eat the babies. Hi, I have a winter white Djungarian hamster. Strype is very sick. We have determined that it was the cage, which me and my girlfriend believe is the culprit. We are babying Strype with care feeding him small amounts of butternut squash or apple in a mashed condition. How much by way of syringe should we feed him? My GF deserves all the credit for Doctoring him up. Each increment is .01 cc or ml same, same. It’s been touch and go with this little guy, who we think is one year old. Can you provide me an answer at [email protected]. I don’t want to blow him up, so we do not make him eat too much. He will not eat, he does drink on his own though. Hi I have 2 male Dwarf hamsters and I’ve had them for about 6 months now. Lately they’ve started “squabbling” at night and I’ve noticed that it’s the one hamster bullying and chasing the other around. I’ve goodled a lot about it and it says not to break it up. After watching a squabble my hamster was running around being chased and then sat in the corner when the other eventually backed off so I held him and he had a very fowl odour. Just let me know what I should do please. Google isn’t helping much. Thanx very much.